Deadline Tomorrow - $230,000 Early Bird in the 2018 St-Boniface Mega Million Choices Lottery! You are here: Home > Deadline Tomorrow – $230,000 Early Bird in the 2018 St-Boniface Mega Million Choices Lottery! $230,000 Early Bird Deadline Tomorrow! Published on March 7, 2018 at 10:00 pm . WINNIPEG, MB, March 8, 2018 — Time is running out — the Early Bird Deadline is midnight tomorrow! With four incredible options to choose from, the $230,000 prize gives the winner a choice between a condo in St. Norbert by Irwin Homes, or a ‘Vacations for Life’ travel package, or an Audi R8 Spyder, or $200,000 cash. And there’s more! 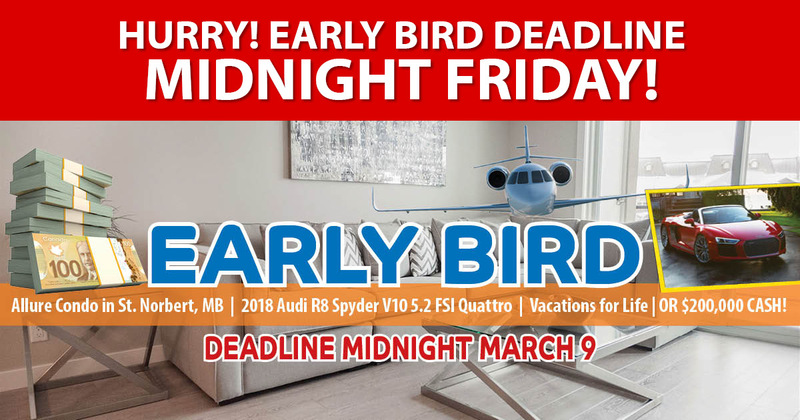 Order before tomorrow’s Early Bird deadline, and you’ll be entered into the Grand Prize draw worth over $1.44 million — homes in Winnipeg, Headingley or Osoyoos BC. Become an instant MILLIONAIRE with $1.1 million tax-free cash. Remember to get your 50/50 Plus™ tickets as well — the jackpot is over $744,000 and the winner takes half. Visit the St-Boniface Mega Million Choices Lottery website for prize details. Order online or by phone at 204-256-7203 (Toll-Free: 1-855-256-7203). Order your tickets before Midnight, Friday, March 9 to be eligible. You can order online or by phone at 204-256-7203 (Toll-Free: 1-855-256-7203). President of Infinite Gravity Digital Media Ltd.